I said this before. I have never been a fan of Mexican food, but for some reason now I like it. I am probably one of the pickiest eaters I know. Sorry Mom and Dad! When I was little I was spoiled, if I didn’t like what we were eating, my dad would make me something different. Spoiled, I know! This was a really easy delicious dinner idea. When I got home it didn’t take much effort to complete. Matt loved it. We discussed the other day though that I need to start making smaller portions because we always have too many leftovers in the fridge. Next month may be more two person recipes. 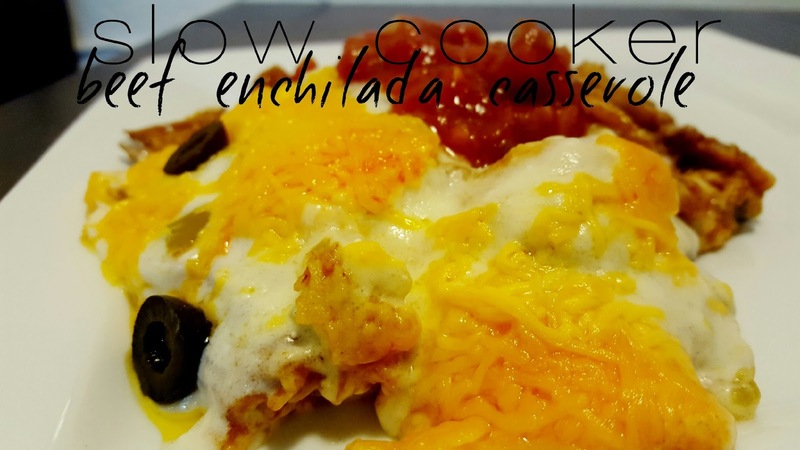 Try these enchilada’s they are bomb! 1. Put the chuck roast in the crock pot dump the enchilada sauce on top. Cook on low for 6 to 8 hours. 2. Once the beef is done, shred the beef in the crock pot. 3. Cut the tortillas into strips, add to the beef and sauce. Stir. 4. Add 1 cup of cheese and half of the olives into the sauce and beef mixture. Stir again. 5. In a small pot melt the butter and add the flour. Add the sour cream, beef broth and the green chilies. Bring to a simmer for 2 to 3 minutes. 6. Pour the sour cream mixture on top of the casserole. Then top with the remaining cheese and olives. 7. Cook on low for another 30 to 45 minutes. This looks quite yummy! Is there a way to speed up some of the secondary steps and not have to have so much time cooking after the initial crock pot cooking is done? The best thing about crock pots for me is you throw stuff in and when you come home from work, dinner is ready. It's so funny how our tastes changes as we progress through life. I didn't used to eat onions but love them now. This casserole recipes sounds yummy to me. Thanks for partying with us at Merry Monday.